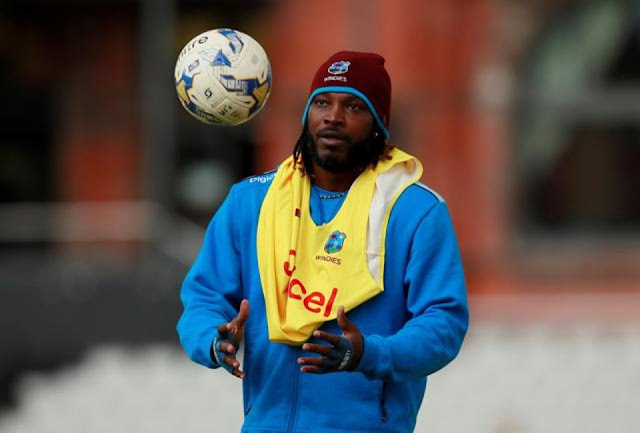 West Indies cricketer Chris Gayle during nets. Tuesday’s fixture at Old Trafford, the first of a five-match ODI series, is set to be powerhouse opening batsman Gayle’s first at this level since the 2015 World Cup -- where he made the first double century in the competition’s history, smashing a blistering 215 against Zimbabwe in Canberra. Holder, not in the Twenty20 squad after leading West Indies in a 2-1 Test series loss to England earlier in the tour, said his side could take some confidence from a win at Chester-le-Street, where they overcame cold and wet conditions to record a convincing victory over England in a repeat of last year’s World Twenty20 final in Kolkata. “That (Saturday’s) result should give is a bit of momentum, albeit a T20 game,” said Holder. “The guys are up for the challenge. We’ve obviously got some new faces coming back into the side and it’s exciting times for our cricket,” said Holder.